The Seahawks got a pick in the third round and sixth as a result of moving down nine spots while also adding a running back. 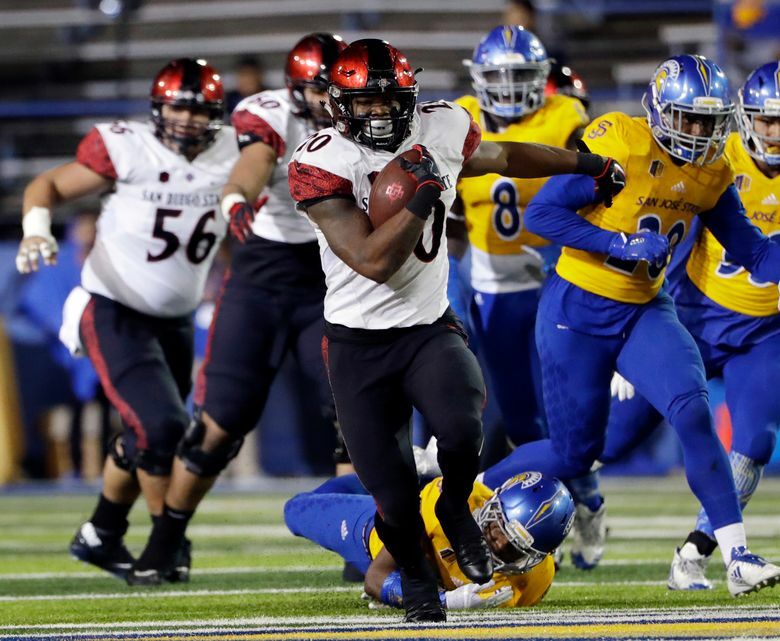 Maybe not every draft expert regarded San Diego State running back Rashaad Penny as a first-rounder. But the Seahawks insisted that they never doubted he was. In fact, they said they felt so strongly he was that they were ready to forgo one of their biggest goals in the draft — trading down to get an additional pick later — to take him at number 18. Instead, when a trade worked out with the Green Bay Packers, the Seahawks felt they got the best of both worlds — picks in the third and sixth rounds which they didn’t have before Thursday — as well as Penny, a player they think can help fix a running game that was one of their biggest weaknesses in 2017. “I don’t mind telling you, this pick fired me up,” Seattle coach Pete Carroll said as he sat down to talk to reporters afterward. Indeed, on paper there is a lot to like about the 5-10, 220-pound Penny. He was not only the most productive runner in college football last year with 2,248 yards (as well as 23 touchdowns) but he also has seven kickoff returns for touchdowns in his career, tying an FBS record. But despite those numbers, some figured Penny as more of a second- or third-rounder, due in part to questions whether playing in the Mountain West Conference helped inflate his stats. But Seattle general manager John Schneider said the Seahawks got all the final convincing they needed when Penny rushed for 64 yards on nine carries in the Senior Bowl as well as scoring on a 73-yard reception. It was no secret the Seahawks wanted to beef up their running game during the draft. Seattle had one of its worst rushing seasons in team history last year, with just one rushing touchdown from a tailback and ending the season with Mike Davis as the leading rusher among tailbacks with just 240 yards, far behind the 586 of quarterback Russell Wilson. The Seahawks knew that was an untenable situation going forward and Carroll had said throughout the offseason that improving the running game would be one of the team’s biggest goals — if not the biggest — heading into the 2018 season. Seattle ranked just 23rd in rushing yards per game last season — at 101.8 — after ranking in the top four every season from 2012-15. “This is really the addition we were hoping to factor into our (running back) room,” Carroll said. Penny said in a conference call with Seattle media that he was not surprised to be taken by the Seahawks saying he had been in constant contact with Seattle coaches throughout the process. But being taken in the first round was another matter. But before the Seahawks could take Penny they wanted to add picks. And as just about everybody figured they’d do given their history, the Seahawks were indeed able to make a move, trading their original first round pick, No. 18 overall, to Green Bay, getting the Packers’ pick at No. 27 (which Green Bay had just acquired from the New Orleans Saints) as well as picks in the third round (76) and sixth round (186) while also giving pick number 248 in the seventh round to Green Bay. Getting a third-rounder — and at least one pick on the second day of the draft — was regarded as a goal for the Seahawks as they did not have picks in the second- or third-round entering the day. Had Seattle not traded it could have gone from number 18 to number 120 without making a pick, a gap the team had hinted strongly they’d try to avoid. Seattle traded the second-rounder last season as part of the defensive tackle Sheldon Richardson deal and the third-rounder for left tackle Duane Brown in October. Seattle has now traded its initial first-round pick every year since 2011 and has also now traded down in the first round to acquire more picks five times in the last seven years (the other two years trading it for Percy Harvin, in 2013, and Jimmy Graham, in 2015). The last time Seattle used its original first-round pick came in 2011 when the Seahawks selected offensive lineman James Carpenter at number 25. Seattle now has eight picks remaining: Round 3 – pick 76; Round 4 – pick 120; Round 5 – pick 141; Round 5 – pick 146; Round 5 – pick 156; Round 5 – pick 168; Round 6 – pick 186; Round 7 -pick 226. As for Penny, he turned out to be the second running back taken in the draft — Penn State’s Saquon Barkley went second overall to the Giants. Several running backs who had been projected to go in the first round were still available when the Seahawks picked, notably LSU’s Derrius Guice and Georgia’s Sony Michel, which led to the idea that Penny might last into the second or third rounds (the Patriots took Michel at pick 31). But the Seahawks could hardly have sounded more excited to get him noting his durability (playing 13, 14 and 14 games the last three seasons) and abiity as a runner, receiver and returner. It’s only the third time in team history Seattle has taken a running back in the first round, the others being Curt Warner in 1983 (third overall) and Shaun Alexander in 2000 (19th).